1949 Universal Postal Union, sixpence. The "Penny Silver" which replaced the "Penny Black". 1998 Calligraphy Symposium, tuppence hapenny: one of a set of four. A good hand is highly esteemed in Fantippo. 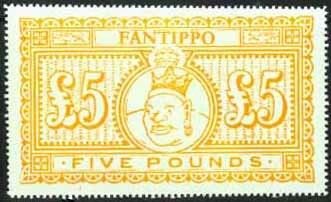 The High Kingdom of Fantippo, is the only country in the twenty-first century that continues to use the old sterling currency, 12 pence = 1 shilling; 20 shillings = £1. 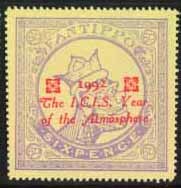 In 1999, Fantippo released a stamp issue honoring the prophecies of Nostradamus, who predicted "the Great King of Terror" to come from the skies. This was later fulfilled with the 11th September anonymous attack on New York's World Trade Center. 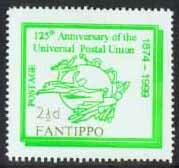 Although not a member of the UPU, Fantippo has twice (in 1949 and again in 1999) issued stamps honoring the Universal Postal Union. 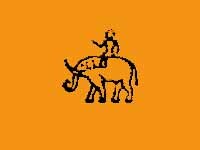 The flag of Fantippo shows a person riding an elephant, with an orange background. 1999 Universal Postal Union, tuppence hapenny. In 2003, a set of stamps showing Toilets was issued to urge folks to always use these helpful and healthy devices to keep down the fly menace.